5/15/17, Well we've had a busy last 6 months, we added more Exhaust for the Late Model Softails and Dyna's. For the Softails we added the Medusa Header, reworked our Softail Mayhem, added Slip-ons and reworked the War-Header for even more performance, For the Late model Dyna's we have added the Mayhem and reworked the War-Header for more power...Plus we have been working feverishly to get our New shop set up in Oregon and qualify new vendors. Our new shop will allow us to increase production plus we will be offering services that we cannot offer in California. While we have worked to keep production interruptions to a minimum, moving our equipment to a different state has caused us to fall behind, so please pardon our dust during this move. Here are a few pictures of our new products. Hacker Custom Exhaust will soon have a BIG inch War-Header available for the 06 up Dyna Models. These have Big primary tubes with a 2 3/4" Tune chambered insert, these will give those Big engines PLENTY of added power! Our Tru-Duels for the Victory Bagger's work well with Victory's Saddlebag guards, here is a picture of our bike on the Road. Hacker Custom Exhaust is now developing our MAYHEM for the 06 up Harley-Davidson Dyna models. We are expecting to start shipping these in mid-late April 2013. Pictures will be up soon. Hacker Custom Exhaust has been testing the Victory Cross Roads, and we now have High Performance stepped Tru-Duel exhaust system available. Our Tru_duels will fit the Cross Roads, Cross Country & Hard Ball. These provide a huge power increase with a nice sounding tone. No power robbing cross over pipe and NO cats, These are REAL Tru-Duel exhaust! WE BELIEVE THESE ARE THE BEST STREET PERFORMANCE EXHAUST YOU CAN GET, AND WILL GIVE ANY RIDER $100.00 IF YOU FIND ANOTHER BRAND OF PRODUCTION PIPES FOR THE VICTORY BAGGERS THAT HAVE BETTER PERFORMANCE BETWEEN 2500 - 5500 rpms! Our Tru-Duels are stepped from 1.750 out of the heads then into 1.875 pipes, then the mufflers have 2.250 dia cores Giving the BEST in power and Torque, far more than any Slip-on! and these come with 2.250 dia Designer heatshields. Options will be all chrome, all black or Black pipes with chrome Designer heatshields, of course we will be offering these in our quiet version for those who ride in noise sensitive areas. Here is a set of the pre-production pipes. Late model Dyna Zoomies are on the Way! NEW! Hacker Custom Exhaust is proud to announce the release of their Anger Management E.F.I. module. This module will compliment the performance oriented exhaust systems by HackerPipes, as well as provide a simple, across the board solution for E.F.I. control. Our AMS modules are available for all Victory's 2000 - 2012, all Harley-Davidson models 95 thru 2012, and all metric bikes with EFI. Our AMS modules have proven to be extremely reliable, ZERO failures in 6 years, very easy to tune and install. Slip-On's for your Ural are now available! NEW!Hacker Custom Exhaust is now manufacturing Slip-On's for your Ural. 2006 Victory 2 into 1 header systems are now available! 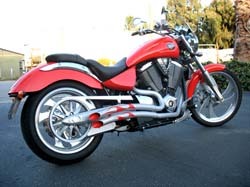 Hacker Custom Exhaust is ready to ship 2 into 1 header systems for your 2006 Victory Vegas, Kingpin, and 8-Ball. We also have a full compliment of choices for 03 up Vegas-8-Ball, Kingpin models as well as for 05 up Hammer and Jackpot models. NEW! 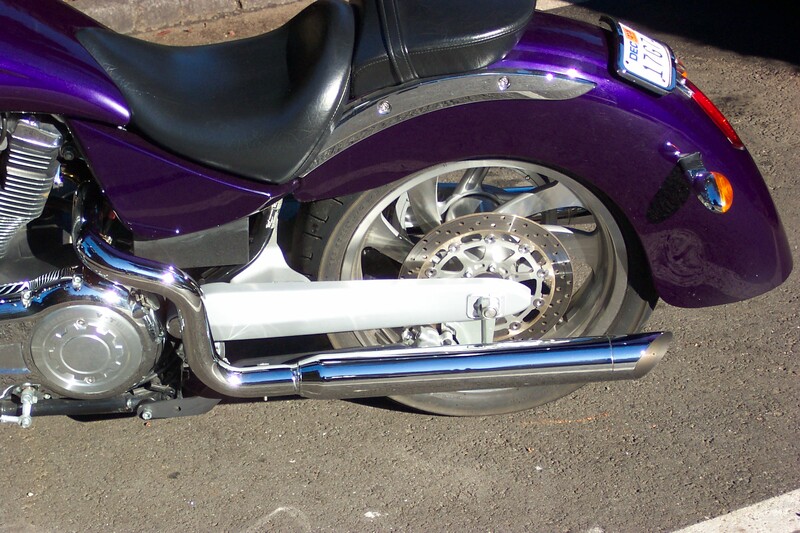 Hacker Custom Exhaust introduce their line of new exhaust for '06 and Up Victory models. "So many people have asked for this style," said Ronnie Hacker, VP of research and development. "Now they can have the look, but with a power increase that our competition just has not been able to produce. This exhaust has unparelled performance between 2,500 and 5,000 RPM's." 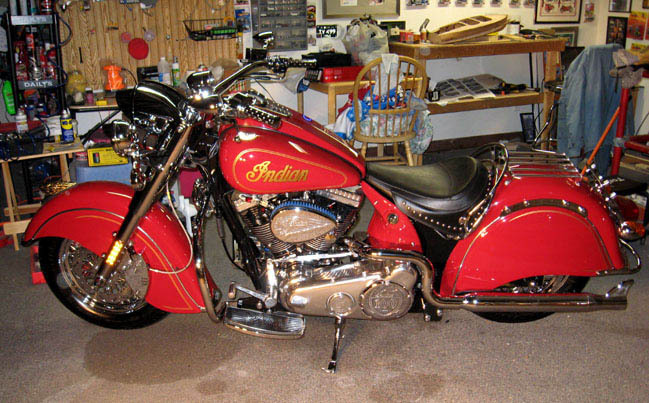 Hacker Custom exhaust introduces 4 high performance exhaust systems for the 02 thru 2010 Indian Chiefs. Exhaust available are the Bendz, Medusa tuned header, Nostalgic tuned header and our Tru-Duels. These exhaust systems will add significant power gains and enhance the look of the bike. Exhaust are available in Black ceramic or Chrome, with your choice of tuned inserts and tips. Copyright © 2001 - 2018 All rights reserved.